ASHRAE has awarded PBA and Saginaw Valley State University (SVSU) with both Chapter and Regional Technology Awards. SVSU places a strong emphasis on being one of the most energy efficient universities in the State of Michigan. In 2013, SVSU reported that of the State’s 15 public universities that submitted energy data that year, SVSU had the lowest utility cost per square foot. 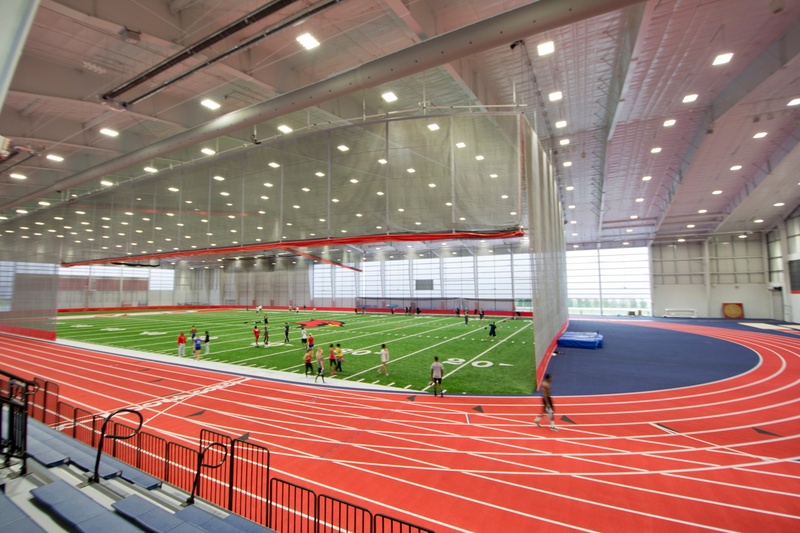 Focusing on SVSU’s energy efficiency goals, the design and construction team for the new 150,000 square foot Ryder Center Fieldhouse addition looked at every available technology to reduce the energy impact of this new building. Housing an indoor practice football, baseball and lacrosse field and a 300-meter indoor running track, the Fieldhouse holds various field and sporting events for the University and area high schools. Heat is provided to the Ryder Center Fieldhouse directly through the use of 34 infrared heaters that are located throughout the playing area, spectator area, and concourse level. The use of infrared heaters reduces tremendous amounts of fan energy that would otherwise heat the space and aid in providing more direct heating to the occupants. Variable air volume bell-shaped centrifugal destratification fans (fans have zero exposed fan blades, minimizing damage from activities) mounted on the high ceilings are used for the Fieldhouse playing floor. In heating mode, the destratification fans automatically modulate speeds—controlled by variable speed drives—to maintain a zero temperature differential from the ceiling space to the playing floor, thus utilizing the stratified heat in the high ceiling space to heat the floor space. Fresh air is provided to the playing surface, spectator area, and concourse level through the use of an indoor variable volume energy recovery air handling unit. The fresh air fan has a range of 5,000 CFM to 20,000 CFM. This system utilizes 92 percent efficient condensing boilers and variable speed drives on all secondary pumps, reducing the energy intensity of the system. The locker and toilet areas are conditioned by a separate energy recovery unit that operates similarly to the Fieldhouse ventilation system. Summer cooling is provided to the Fieldhouse by a fan wall made up of 24 variable speed controlled fans that can draw as much as 240,000 CFM of outdoor air into the Fieldhouse to help temper the space during warm temperatures. Instead of using several large insulated dampers to close off the exterior louver—which helps to provide space tempering during the cooling season—four heavily insulated roll-up garage doors were used to block off the louver wall. It is estimated that the insulated roll-up garage doors will provide 40 percent energy savings over a standard insulated damper through the reduction of infiltration and heat transfer. Lighting for the new Ryder Center Fieldhouse addition playing floor and spectators’ area is provided by energy efficient LED fixtures that provide direct light to the field without wasting any light. The LED fixtures have a rated life expectancy of more than 50,000 hours. The resulting reduced 51,205 watts provided $17,921 in energy rebates. With all of the energy efficiency measures installed in the Fieldhouse, it is estimated that this building is thirty percent more energy efficient than a standard ASHRAE 90.1 2007 baseline building of similar size and use. Moreover, the new addition was not separately metered, however, the metered campus natural gas usage dropped from 86 KBTU/SF in 2010 to 73 KBTU/SF in 2014 and electrical usage dropped from 11.56 KWH/SF in 2010 to 10.02 KWH/SF in 2014. The Consumer Energy rebates, which totaled $52,200 obtained by SVSU, allowed the University to purchase more energy efficient equipment because of the reduced up-front cost.